The visually impaired usually navigate by sound and by feel, often with a cane, but with new wearable technology advancing so rapidly, high tech navigation may soon be in their future. Tactile Navigation Tools is developing a set of sensing and vibrating clothes that can ‘see’ what’s around the wearer and alert them to objects’ locations through vibrations. Called Eyeronman, the wearable navigation system consists of a vest that can sense obstacles along with a vibrating tshirt that indications location. The system may even be helpful for first responders like firefighters and policemen when their vision is limited. Tactile Navigation Tools is currently working on the Eyeronman, a hands-free wearable device that should help improve navigation for those who are visually impaired or blind. The system consists first of a vest with three types of sensors integrated into it that can detect environmental obstacles. The first sensor type is LiDAR, which is a laser detector like what is being used in self driving cars, then it uses ultrasound like what bats use for echolocation. Finally, the vest uses infrared, as seen in the thermal detection of pit vipers or night vision. All of these sensors work together to create an even more accurate record of where objects are. 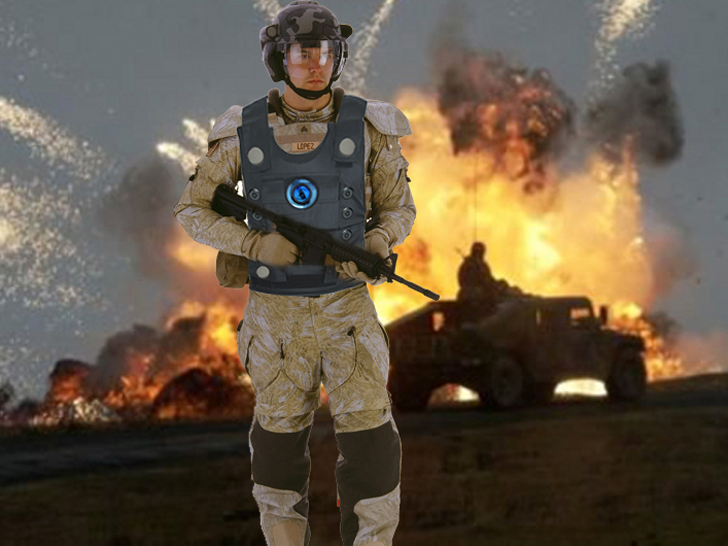 The information from the sensors in the vest is then passed on to an electronic textile (e-textile) shirts outfitted with electro-active polymers (EAP) and conductive thread. When activated, these polymers will vibrate so the wearer can feel them and the location of the vibration indicates a relative position of the obstacle. For instance a vibration in the lower left front portion of the shirt means there is an object at the wearers feet in front of them. Likewise, a vibration in their middle back means there is an object behind them at about waist height. Tactile Navigation Tools‘ goal is to develop more advanced systems to aid the visually impaired. The foresee this system giving blind people improved feelings and contextual understandings of their location and surroundings. In addition, the New York City firm envisions this kind of technology to be beneficial to firefighters, police officers and the military to improve navigation in smoky, dark or combat zones. Great ideas-It should revolution every thing for the Blind. The visually impaired usually navigate by sound and by feel, often with a cane, but with new wearable technology advancing so rapidly, high tech navigation may soon be in their future. Tactile Navigation Tools is developing a set of sensing and vibrating clothes that can 'see' what's around the wearer and alert them to objects' locations through vibrations. Called Eyeronman, the wearable navigation system consists of a vest that can sense obstacles along with a vibrating tshirt that indications location. The system may even be helpful for first responders like firefighters and policemen when their vision is limited.